News InterOcean Advises on Sale of F & B Mfg. Co.
InterOcean Advises on Sale of F & B Mfg. 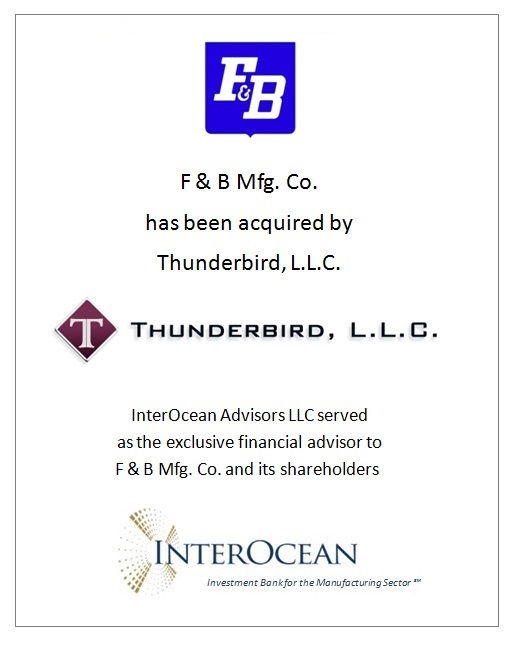 Co.
InterOcean Advisors LLC (“InterOcean”) announced today that its client, F & B Mfg. Co. (“F&B”), has been acquired by Thunderbird LLC, a private partnership that seeks to acquire metals-based manufacturing businesses in the United States. InterOcean initiated, structured and negotiated the sale. F&B is a leading manufacturer of highly specialized, precision component parts and sub-assemblies for the commercial and military aerospace and semi-conductor industries, specializing in components for engines, auxiliary power units and environmental control systems. F&B has been in business for nearly 90 years and is located in Phoenix, AZ. “We are very excited about the new partnership with Thunderbird, which will provide F&B with additional resources that will help F&B capitalize fully on key growth opportunities,” said Elizabeth Kepuraitis, President of F&B. InterOcean Advisors is a Chicago-based investment bank that provides mergers and acquisitions and capital raising advisory services to manufacturing and distribution/business services companies. For more information, please visit www.ioadvisors.com.